"You Know What Will Happen If He Catches You"
This article contains a lot of speculation. This usually occurs from pre-release media, or just things that are still unknown, so please keep that in mind while reading this page. We will continue to update this article with the most accurate information as more solid evidence is supplied. Were you looking for a similar character in the third game, Phone Dude? Phone Guy is the deuteragonist of Five Nights at Freddy's. He is the previous security guard at Freddy Fazbear's Pizza, who worked in The Office sometime prior to the events of the game. He helps the player by providing information about the behaviors of the animatronics at the start of each night until Night 4, which is his final message. Players dispute whether or not the Phone Guy is actually an ally, as it seems odd that he insists that they stay and downplays the situation instead of telling them to quit or leave immediately. While he may be a forced ally, he is the only one the player has. Phone Guy is somewhat nonchalant, with absolutely no explanation as to why. Throughout the game, he does his best to inform the player that there's "really nothing to worry about," despite the obvious danger of being killed by the animatronics. It is unknown if he is obligated to lie to the guards, or if he is simply trying to make Mike feel better, although the latter is more likely. He seems to be very hesitant and awkward at times, often stuttering and laughing nervously, implying that he might be worried about the possibility of someone hearing his warnings and advice regarding the animatronics. Of course, it is also likely that he is generally anxious and on edge due to the thought of imminent danger on his conscience. From Night 1, up until Night 4, Phone Guy will call and leave a message. The messages are transcribed below. “ Hello, hello? Uh, I wanted to record a message for you to help you get settled in on your first night. Um, I actually worked in that office before you. I'm finishing up my last week now, as a matter of fact. So, I know it can be a bit overwhelming, but I'm here to tell you there's nothing to worry about. Uh, you'll do fine. So, let's just focus on getting you through your first week. Okay? Uh, let's see, first there's an introductory greeting from the company that I'm supposed to read. Uh, it's kind of a legal thing, you know. Um, "Welcome to Freddy Fazbear's Pizza. A magical place for kids and grown-ups alike, where fantasy and fun come to life. Fazbear Entertainment is not responsible for damage to property or person. Upon discovering that damage or death has occurred, a missing person report will be filed within 90 days, or as soon property and premises have been thoroughly cleaned and bleached, and the carpets have been replaced." Blah blah blah, now that might sound bad, I know, but there's really nothing to worry about. Uh, the animatronic characters here do get a bit quirky at night, but do I blame them? No. If I were forced to sing those same stupid songs for twenty years and I never got a bath? I'd probably be a bit irritable at night too. So, remember, these characters hold a special place in the hearts of children and we need to show them a little respect, right? Okay. So, just be aware, the characters do tend to wander a bit. Uh, they're left in some kind of free roaming mode at night. Uh...Something about their servos locking up if they get turned off for too long. Uh, they used to be allowed to walk around during the day too. But then there was The Bite of '87. Yeah. I-It's amazing that the human body can live without the frontal lobe, you know? Uh, now concerning your safety, the only real risk to you as a night watchman here, if any, is the fact that these characters, uh, if they happen to see you after hours probably won't recognize you as a person. They'll p-most likely see you as a metal endoskeleton without its costume on. Now since that's against the rules here at Freddy Fazbear's Pizza, they'll probably try to...forcefully stuff you inside a Freddy Fazbear suit. Um, now, that wouldn't be so bad if the suits themselves weren't filled with crossbeams, wires, and animatronic devices, especially around the facial area. So, you could imagine how having your head forcefully pressed inside one of those could cause a bit of discomfort...and death. Uh, the only parts of you that would likely see the light of day again would be your eyeballs and teeth when they pop out the front of the mask, heh. Y-Yeah, they don't tell you these things when you sign up. But hey, first day should be a breeze. I'll chat with you tomorrow. Uh, check those cameras, and remember to close the doors only if absolutely necessary. Gotta conserve power. Alright, good night. Uh... Interestingly enough, Freddy himself doesn't come off stage very often. I heard he becomes a lot more active in the dark though, so, hey, I guess that's one more reason not to run out of power, right? I-I also want to emphasize the importance of using your door lights. There are blind spots in your camera views, and those blind spots happen to be right outside of your doors. So if-if you can’t find something, or someone, on your cameras, be sure to check the door lights. Uh, you might only have a few seconds to react... Uh, not that you would be in any danger, of course. I'm not implying that. Also, check on the curtain in Pirate Cove from time to time. The character in there seems unique in that he becomes more active if the cameras remain off for long periods of time. I guess he doesn't like being watched. I don't know. Anyway, I'm sure you have everything under control! Uh, talk to you soon. “ ''Hello, hello? Hey you're doing great! Most people don’t last this long. I mean, you know, they usually move on to other things by now. I'm not implying that they died. Th-th-that’s not what I meant. Uh, anyway I better not take up too much of your time. Things start getting real tonight. Uh... Hey, listen, I had an idea: if you happen to get caught and want to avoid getting stuffed into a Freddy suit, uhh, try playing dead! You know, go limp. Then there's a chance that, uh, maybe they’ll think that you're an empty costume instead. Then again if they think you're an empty costume, they might try to... stuff a metal skeleton into you. I wonder how that would work. Yeah, never mind, scratch that. It's best just not to get caught. Um... Ok, I'll leave you to it. See you on the flip side. “ Hello, hello? Hey! Hey, wow, day 4. I knew you could do it. Uh, hey, listen, I may not be around to send you a message tomorrow. *banging sound* It's-It's been a bad night here for me. Um, I-I'm kinda glad that I recorded my messages for you *clears throat* uh, when I did. Uh, hey, do me a favor. *bang bang* Maybe sometime, uh, you could check inside those suits in the back room? *bang bang* I'm gonna to try to hold out until someone checks. Maybe it won’t be so bad. *bang bang* Uh, I-I-I-I always wondered what was in all those empty heads back there. *chime plays*. — Phone Guy's final call. Phone Guy is voiced by the game's developer, Scott Cawthon. Unlike most voice actors in the FNAF franchise, Scott Cawthon uses his natural speaking voice when voicing Phone Guy. It is quite important to listen to what he has to say on the first and second night for players new to the game. He will give the player key hints on gameplay and the mechanics of how the game works. He acts as the game's version of a tutorial. It was commonly theorized that Phone Guy is stuffed inside of Chica, as a second row of smaller teeth can be seen in her mouth, as well as the fact that Chica will sometimes make very raspy, human-like groaning noises when close to the player. However, many debates that the teeth simply belongs to the Endoskeleton inside the suit (as looking closely, it is possible to see the same in Bonnie's mouth), and that the rasping noises are not specific to Chica, as Bonnie is known to make the same sounds. 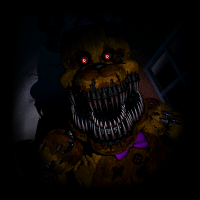 Likewise, some speculate that the Phone Guy was not stuffed into Chica on Night 4, but into Golden Freddy instead. Evidence to support this would be that he has a limp, lifeless body that is in a position that is commonly adopted by dead bodies while sat down. It is also notable that, right before the phone call on Night 4 ends, Golden Freddy's kill sound can be heard. It is also possible that the Phone Guy was stuffed into one of the heads Backstage, as he asks the player to check inside the suits in the back room and always wondered what was inside them. This heavily implies that he knew he was going to die, and that he would be stuffed into an animatronic suit or head. Even when Phone Guy is talking to the player over the phone, it is important to keep an eye out for Freddy Fazbear and the other animatronics (he even tells the player this himself). If the player loses focus, they'll likely get attacked and stuffed into a Freddy suit soon after the message, sometimes even before it finishes. This is notable on later nights, as remaining idle can result in Foxy killing the player before Phone Guy has even finished speaking on the phone. The quotation from Autobiography of a Yogi on Night 5 is from a chapter in which Yogananda posits that metal has a life force. It is possible that this is in reference to the animatronics, who are made of metal but are alive. It is also worth noting that Phone Guy's messages are not deleted. With all the information given, it is odd that the company has not removed them or replaced them with standard legal information. In an interview with ClickTeam, Scott refers to Phone Guy literally as "Phone Guy," implying Phone Guy currently has no canon name. In the phone call on Night 4, the banging sound emitted in the background is different from the one actually heard in-game when Foxy is at the door. Anytime during the game, the player has the ability to mute Phone Guy's calls by clicking the button on the top left that reads "Mute Call". This can also be done in the second and third game. Every one of Phone Guy's calls is shorter than the last. This also applies to the third game. Phone Guy is the first character in the entire series to have voice acting. He and his third game's equivalent, Phone Dude, were also the only characters in the core series to have voice acting prior to the release of Sister Location, and in the whole franchise prior to the release of FNAF World. Phone Guy makes his second appearance in Five Nights at Freddy's 2, reprising his role as deuteragonist to the player. He acts mostly the same way as in the first game, giving the player helpful tips on the basic mechanics of the game. Unlike in the first game, Phone Guy seems to be genuinely comfortable with working at his job and doesn't seem to be concerned about the animatronics being hostile. This is likely because he was working the day shift during the time, and did not truly understand the danger until taking over the night watch. The only time he ever shows a sense of urgency in his voice is on Night 6's phone call, where he seems almost angry. Despite this, he still makes a point to give the player advice for surviving the first few nights, but also maintains that the restaurant is dedicated to employee safety, and that "there is nothing to worry about", which obviously isn't true for the protagonist. From Night 1, up until Night 6, Phone Guy will call and leave a message. The messages are transcribed below. “ Uh, hello? Hello, hello? Uh, hello and welcome to your new summer job at the new and improved Freddy Fazbear's Pizza. Uh, I'm here to talk you through some of the things you can expect to see during your first week here and to help you get started down this new and exciting career path. Uh, now, I want you to forget anything you may have heard about the old location, you know. Uh, some people still have a somewhat negative impression of the company. Uh... that old restaurant was kind of left to rot for quite a while, but I want to reassure you, Fazbear Entertainment is committed to family fun and above all, safety. They've spent a small fortune on these new animatronics, uh, facial recognition, advanced mobility, they even let them walk around during the day. Isn't that neat? -clears throat But most importantly, they're all tied into some kind of criminal database, so they can detect a predator a mile away. Heck, we should be paying them to guard you. Uh, now that being said, no new system's without its... kinks. Uh... you're only the second guard to work at that location. Uh, the first guy finished his week, but complained about... conditions. Uh, we switched him over to the day shift, so hey, lucky you, right? Uh mainly he expressed concern that certain characters seemed to move around at night, and even attempted to get into his office. Now, from what we know, that should be impossible. Uh, that restaurant should be the safest place on earth. So while our engineers don't really have an explanation for this, the working theory is that... the robots were never given a proper "night mode". So when it gets quiet, they think they're in the wrong room, so then they go try to find where the people are, and in this case, that's your office. So our temporary solution is this: there's a music box over by the Prize Counter, and it's rigged to be wound up remotely. So just, every once in a while, switch over to the Prize Counter video feed and wind it up for a few seconds. It doesn't seem to affect all of the animatronics, but it does affect... one of them. -clears throat Uh, and as for the rest of them, we have an even easier solution. You see, there may be a minor glitch in the system, something about robots seeing you as an endoskeleton without his costume on, and wanting to stuff you in a suit, so hey, we've given you an empty Freddy Fazbear head, problem solved! You can put it on anytime, and leave it on for as long as you want. Eventually anything that wandered in, will wander back out. Uh, something else worth mentioning is kind of the modern design of the building. You may have noticed there are no doors for you to close, heh. But hey, you have a light! And even though your flashlight can run out of power, the building cannot. So, don't worry about the place going dark. Well, I think that's it. Uh, you should be golden. Uh, check the lights, put on the Freddy head if you need to, uh, keep the music box wound up, piece of cake. Have a good night, and I'll talk to you tomorrow. “ Ah...hello, hello! Uh, see, I told you your first night wouldn't be a problem. You're a natural! Uh, by now I'm sure you've noticed the older models sitting in the back room. Uh, those are from the previous location. We just use them for parts now. The idea at first was to repair them...uh, they even started retrofitting them with some of the newer technology, but they were just so ugly, you know? The smell...uh, so the company decided to go in a whole new direction and make them super kid-friendly. Uh, those older ones shouldn't be able to walk around, but if they do, the whole Freddy head trick should work on them too, so, whatever. Uh...heh...I love those old characters. Did you ever see Foxy the pirate? Oh wait, hold on...oh yeah, Foxy. Uh, hey listen, that one was always a bit twitchy, uh...I'm not sure the Freddy head trick will work on Foxy, uh. If for some reason he activates during the night and you see him standing at the far end of the hall, just flash your light at him from time to time. Those older models would always get disoriented with bright lights. It would cause a system restart, or something. Uh, come to think of it, you might want to try that on any room where something undesirable might be. It might hold them in place for a few seconds. (That glitch?) might be in some of the newer models too. One more thing - don't forget the music box. I'll be honest, I never liked that puppet thing. It's always...thinking, and it can go anywhere...I don't think a Freddy mask will fool it, so just don't forget the music box. Anyway, I'm sure it won't be a problem. Uh, have a good night, and talk to you tomorrow. “ Hello hello! See? I told you you wouldn't have any problems! Oh, hey, before I go, uh, I wanted to ease your mind about any rumors you might have heard lately. You know how these local stories come and go and seldom mean anything. I can personally assure you that, whatever is going on out there, and however tragic it may be, has nothing to do with our establishment. It's just all rumor and speculation... People trying to make a buck. You know... Uh, our guard during the day has reported nothing unusual. And he's on watch from opening til close. Okay, well anyway, hang in there and I'll talk to you tomorrow. “ "Hello? Hello? Uh, hey there, night four! I told you you'd get the hang of it! Ok, so uh, just to update you, uh, there's been somewhat of an, uh, investigation going on. Uh, we may end up having to close for a few days... I don't know. I want to emphasize though that it's really just a precaution. Uh, Fazbear Entertainment denies any wrongdoing. These things happen sometimes. Um... It'll all get sorted out in a few days. Just keep an eye on things and I'll keep you posted. Uh, just as a side note though, try to avoid eye contact with any of the animatronics tonight if you can. Someone may have tampered with their facial recognition systems - we're not sure. But the characters have been acting very unusual, almost aggressive towards the staff. They interact with the kids just fine, but when they encounter an adult, they just...stare. Uh...Anyways, hang tight. It'll all pass. Good night! “ Hello? Hey, good job, night five! Um, hey, um, keep a close eye on things tonight, okay? Um, from what I understand, the building is on lockdown, uh, no one is allowed in or out, y'know, especially concerning any...previous employees. Um, when we get it all sorted out, we may move you to the day shift, a position just became...available. Uh, we don't have a replacement for your shift yet, but we're working on it. Uh, we're going to try to contact the original restaurant owner. Uh, I think the name of the place was..."Fredbear's Family Diner" or something like that. It's been closed for years though, I doubt we'll be able to track anybody down. Well, just get through one more night! Uh, hang in there! Goodnight! “ Hello? Hello...uh...what on earth are you doing there, uh didn’t you get the memo, uh, the place is closed down, uh, at least for a while. Someone used one of the suits. We had a spare in the back, a yellow one, someone used it...now none of them are acting right. Listen j-just finish your shift it’s safer than trying to leave in the middle of the night. Uh we have one more event scheduled for tomorrow, a birthday. You’ll be on day shift, wear your uniform, stay close to the animatronics, make sure they don’t hurt anyone okay, uh for now just make it through the night, uh when the place eventually opens again I’ll probably take the night shift myself. Okay, good night and good luck. Phone Guy never explicitly states what his job is at ﻿the establishment and always refers to everyone as ﻿the employees and management instead of coworkers. On Night 2, he states that he "loved those old characters" but never liked "that Puppet thing" because "it was always thinking" and "can go anywhere." On Night 3, he states that Foxy was always his favorite. On Night 6, Phone Guy seems to be very concerned and may even be angry from his tone of voice. It is possible he was worried about the usage of the yellow suit in the back. Nevertheless, it is also possible that he was upset with Jeremy being there after lockdown. This also supports the fact that Golden Freddy is active on Night 6. The quote from Phone Guy in the Five Nights at Freddy's 2 trailer is never actually used in any of the games. Phone Guy also appears in Five Nights at Freddy's 3, only present in the training tapes founded by Phone Dude, starting on the beginning of Night 2. The original Phone Guy in the training tapes is unchanged for the most part though, here, he is a lot more formal and less expressive, likely because he is speaking as an instructor rather than talking to the player off-hours. “ Hey, man- okay, I have some awesome news for you! First of all, we found some vintage audio training cassettes! Dude, these are, like, prehistoric! I think they were, like, training tapes for like, other employees or something like that. So, I thought we could, like, have them playing, like, over the speakers as people walk through the attraction. Dude, that makes this feel legit, man. But I have an even better surprise for you, and you're not gonna believe this- we found one. A REAL one. Uh-oh-uh gotta go man- uh, well-well look, i-it's in there somewhere, I'm-I'm sure you'll see it. Okay, I'll leave you with some of this great audio that I found! Talk to you later, man! “ Uh, hello! Hello, hello! Uh, welcome to your new career as a performer/entertainer for Freddy Fazbear's Pizza. Uh, these tapes will provide you with much needed information on how to handle/climb into/climb out of mascot costumes. Right now, we have two specially designed suits that double as both animatronics and suits. So please pay close attention while learning how to operate these suits as accidents/injuries/death/irreparable and grotesque maiming can occur. First and most discussed is how to operate the mascots while in animatronic form. For ease of operation, the animatronics are set to turn and walk towards sounds they hear which is an easy and hands-free approach to making sure the animatronics stay where the children are for maximum entertainment/crowd-pleasing value. To change the animatronics to suit mode, insert and turn firmly the hand crank provided by the manufacturer. Turning the crank will recoil and compress the animatronic parts around the sides of the suit, providing room to climb inside. Please make sure the spring locks are fastened tight to ensure the animatronic devices remain safe. We will cover this in more detail in tomorrow's session. Remember to smile; you are the face of Freddy Fazbear's Pizza. Uh, hello, hello. Uh, for today's lesson, we will be continuing our training on proper suit-handling techniques. When using an animatronic as a suit, please ensure that the animatronic parts are tightly compressed and fastened by the spring locks located around the inside of the suit. It may take a few moments to position your head and torso between these parts in a manner where you can move and speak. Try not to nudge or press against any of the spring locks inside the suit. Do not touch the spring locks at any time. Do not breathe on the spring locks, as moisture may loosen them, and cause them to break loose. In the case of the spring-locks come loose while you are wearing the suit, please try to maneuver away from populated areas before bleeding out, as to not ruin the customers' experience. As always, if there is ever an emergency, please go to the designated safe room. Every location is built with one extra room that is not included in the digital map layout programmed in the animatronics or the security cameras. This room is hidden to customers, invisible to animatronics, and is always off-camera. As always, remember to smile; you are the face of Freddy Fazbear's Pizza. Uh, hello? Hello, hello! Uh, there's been a slight change of company policy concerning use of the suits. Um, don't. After learning of an unfortunate incident at the sister location, involving multiple and simultaneous spring lock failures, the company has deemed the suits temporarily unfit for employees. Safety is our top priority at Freddy Fazbear's Pizza, which is why the classic suits are being retired to an appropriate location, while being looked at by our technician. Until replacements arrive, you'll be expected to wear the temporary costumes provided to you. Keep in mind that they were found on very short notice, so questions about appropriateness/relevance should be deflected. I repeat, the classic suits are not to be touched, activated or worn. That being said, we are free of liability, do as you wish. As always, remember to smile; you are the face of Freddy Fazbear's Pizza. Hello? Hello? Um, this is just a reminder of company policy concerning the safe room. The safe room is reserved for equipment and/or other property not being currently used and is in fact a safety location for employees only. This is not a break room, and should not be considered a place for employees to hide and/or congregate - and under no circumstance should a customer ever be taken into this room and out of the main show area. Management has also been made aware that the spring Bonnie animatronic has been noticeably moved. We would like to remind employees that this costume is not safe to wear under any circumstances. Thank you and remember to smile; you are the face of Freddy Fazbear's Pizza. Uh, hello? Hello? Uh, this is just to inform all employees that due to budget restrictions, the previously mentioned safe rooms are being sealed at most locations, including this one. Work crews will be here most of the day today, constructing a false wall over the old door base. Nothing is being taken out beforehand, so if you've left anything inside, then it's your own fault. Management also requests that this room not be mentioned to family, friends or insurance representatives. Thanks again, and remember to smile; you are the face of Freddy Fazbear's Pizza. Every one of Phone Guy's calls is shorter than the last. This also applies to the first game. Strangely, Phone Guy's calls strongly implies that Freddy Fazbear's Pizza has springlock suits although the last two previous games didn't have springlock animatronics. Phone Guy does not appear in Five Nights at Freddy's 4 However, it is possible to hear his first phone call from the first game as an ambient sound. The radio-like ambiance. Note that the deep, reversed version of Phone Guy's first call from the first game is heard. Although Phone Guy does not return in Five Nights at Freddy's: Sister Location, both HandUnit and Circus Baby have similar roles. While Phone Guy did not not return in Freddy Fazbear's Pizzeria Simulator, a similar character by the name of Cassette Man takes his place. Phone Guy finally returns in Ultimate Custom Night as one of the selectable characters. Phone Guy will call at random into the Office, and the player will only have a brief amount of time to mute his call. If the player fails to mute the call in time, the mute button will disappear completely, and they will be forced to listen to the call in its entirety. This can be very problematic, as it can be both distracting for the player and also agitating to sound-sensitive animatronics, such as Music Man. The mute button can appear in any location on the screen, following no pattern and based seemingly on pure randomness. This can make it difficult for an unprepared player to respond to his calls, and as such, the player must remain cautious. Phone Guy, Trash and the Gang, Helpy, and Old Man Consequences are the only non-animatronic characters of the game. All Phone Guy's calls are actually recycled from first three installments of the series. The phone of the Phone Guy is blue, but is not seen in-game. This is the first and only instance where Phone Guy functions as an antagonist capable of indirectly harming the player, as in every other one of his appearances, he has either provided crucial instructions or simply appeared for story or ambiance purposes. The texture of the "Mute Call" button. The texture of the "Mute Call" button with more different styles.